Teresa Schleigh's amazing artwork is featured on the Salt Creek site . The incredible artwork on our site is compliments of western artist, Teresa Schleigh. A 6th generation rancher, Teresa draws from her everyday experiences to draw and paint these breathtaking images. After cowboying for eight years with outfits in Northern California and Southern Oregon, she and Dan settled back at the family ranch to raise their son, Clint. 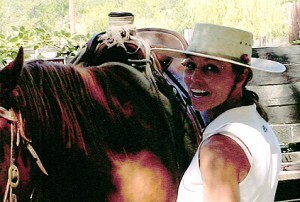 She currently lives and works daily with her husband, Dan on her family ranch. We have just given you a small glimpse into the incredible artistic talent of Teresa Schleigh. For more information, or to order one of the images you see here, visit Teresa’s website.